Please make sure 'webbuilder.exe' has access to the Internet. 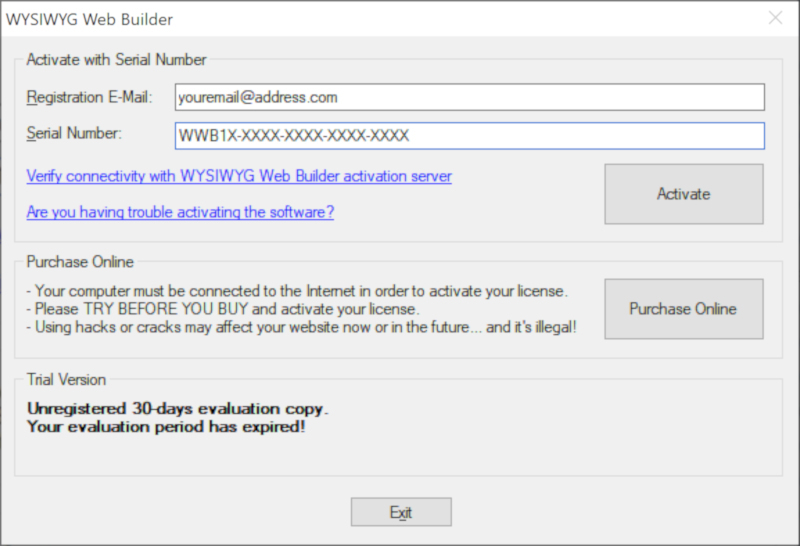 If your copy of WYSIWYG Web Builder is not yet activated it will show the 'Activation window' on startup. In the 'Registration Name' field enter the email address you used to purchase the software. In the 'Serial Number' field enter the code you've received in the confirmation email for the reseller (emetrix, esellerate, paypal or bradsoft). 3. WYSIWYG Web Builder will connect to the registration server and validate if the specified data is correct. II) Does your firewall block the internet connection? Make sure Web Builder is not on the blacklist. III) Another common problem is that users still use an old version of WYSIWYG Web Builder. The license key you've received only works on the current version, not on previous versions (like WYSIWYG Web Builder 4.x). You can activate 1 WYSIWYG Web Builder license on maximum 3 computers. This number will reset itself after some time, so normally you should not run into this problem. The first time you activate WYSIWYG Web Builder that email will be linked to the serial number you've received by email. Make sure you use the same email address that you've used for the first activation of WYSIWYG Web Builder. If you have previously activated the software using an illegal serial number, then the activation screen may not appear. Or it may have corrupted your website project. In that case please contact support@pablosoftwaresolutions.com so we can try to help you recover your work. Don't forget to mention your official license information otherwise we won't be able to help you! Re: How to activate WYSIWYG Web Builder? So make sure IE is configured to connect to the Internet. Also make sure IE is not set to 'offline'. Make sure you also configure 'Antivirus Real Time' to allow webbuilder.exe to use the Internet connection. Note that WYSIWYG Web Builder cannot bypass your firewall (otherwise the firewall would be useless...) so only you (the administrator of the computer) can configure BullGuard to allow access to the Internet connection. Bullguard sent the following instructions to help users activate WYSIWYG Web Builder. Thanks to Steve! 1. Double-click on the BullGuard icon in the System Tray and open the application. 2. Click on the "Settings" option from the upper part of BullGuard's window. 3. From the left panel of the window, choose "General" (Advanced Mode) > "Advanced" > Main and disable the "Allow BullGuard to protect its components against termination" option. 4. Restart the computer and check if the issue persists. 5. Open BullGuard > "Settings" and navigate to the "Antivirus" section from the left panel of the window and turn off the module by clicking on the button next to "Antivirus Protection". 6. Click on the back button from the upper left corner of BullGuard and check if the issue persists. 7. Go to the "Firewall" section and disable this BullGuard engine, then click on the back button. 9. Test if the problem is still there. 10. Go to the "Spamfilter" section and disable this BullGuard engine, as well. 12. Check if the problem persists. 13. Navigate to the "Vulnerabilities" section and turn off the module. 15. Check again if the issue persists. 16. Right-click the BullGuard icon in the System Tray and select "Exit". 17. Disable the entire application, restart the computer and check if the problem is still there. Also, very important, I recommend that after taking these steps you re-enable BullGuard and turn back on the Antivirus, Firewall, Spamfilter and Vulnerabilities plugins, for your machine's protection.